As with most Southeast Asian fare, visitors to Malaysia will likewise find ours to be really flavourful and oftentimes spicy. As you shall see shortly, however, this isn't always the case and I guarantee you're bound to find with relative ease something that will agree with your palate. Here are six of arguably our most popular local dishes. CURRY LAKSA (pronounced "lahk-sa") is a curry soup with noodles dish that's just bursting with flavours. Its creamy soup - the result of the infusion of rich coconut milk - carries the unmistakable spiciness of chilli and fragrance of spices. The coconut milk lends a sweet, distinctive taste and richness to the dish. 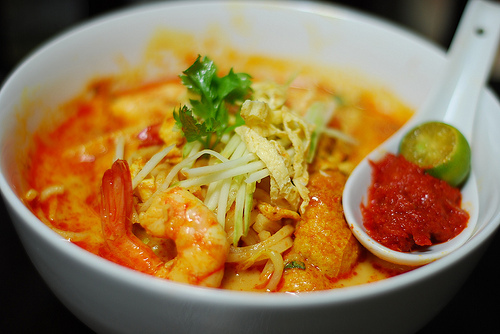 Curry laksa is usually served with shrimp, cockles, fish sticks, bean sprouts, tofu puffs and cucumber. Oftentimes the dish comes with a spoonful of chilli paste and light coriander garnishing for that extra "oomph". All-vegetable variants are also available for vegans. Curry laksa never fails to satisfy the appetite and hits the senses like little else can. Popularly consumed for breakfast and lunch. SATAY (pronounced "sah-tay") - a signature Malaysian dish - is essentially skewered chicken or beef grilled over charcoal fire. They look like your local kebabs really; only smaller. Tumeric is used to marinate the meat pieces - giving them their bright golden hue. 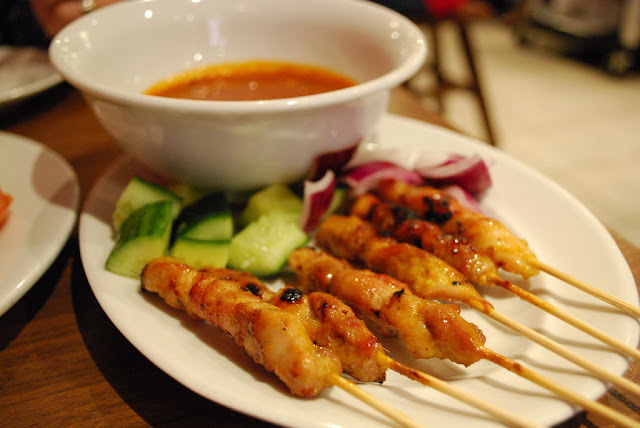 Properly-done, satays are extremely tender and juicy and are best enjoyed with a thick peanut dip. Rice cubes, cucumber slices and fresh shallot onions are usually served as accompaniment. 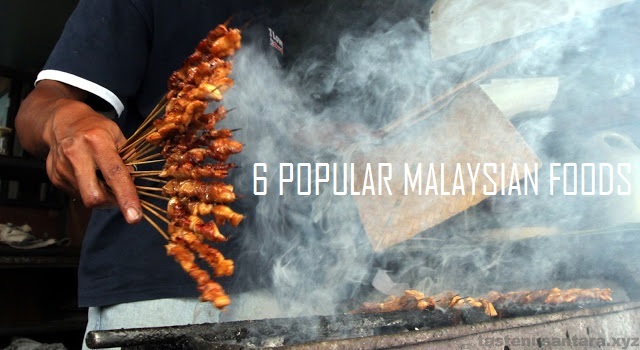 Satay is a favourite snack food here in Malaysia, and can easily be found anywhere from street hawkers to mid-range restaurants to 5-star hotels throughout the country. This is one original Malaysian recipe I promise you'll absolutely adore; many visitors will testify to that. Excellent with beer! 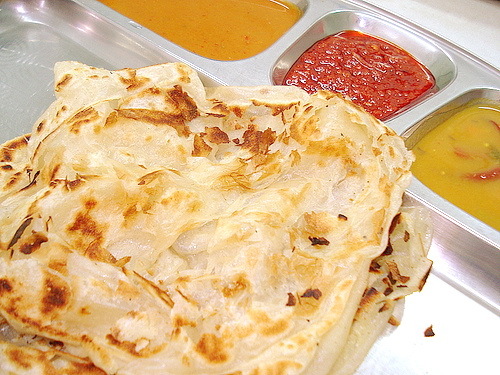 ROTI CANAI (pronounced "roh-tee cha-nai") is an Indian-influenced light, crispy flat bread. Its circular shape is the result of twirling the wheat flour dough until it becomes a very thin sheet (this is an acquired skill; a bit like the pizza man kneading his dough). The dough is then folded into a circular shape and grilled on a griddle with either oil or butter. Served piping hot with curry, dhall (lentil) and/or chutney as dips, roti canai is probably the most affordable filling meal one can find in Malaysia. Such is its popularity that this unique Malaysian food is consumed by Malaysians rich and poor throughout the day - even as a late-night meal. 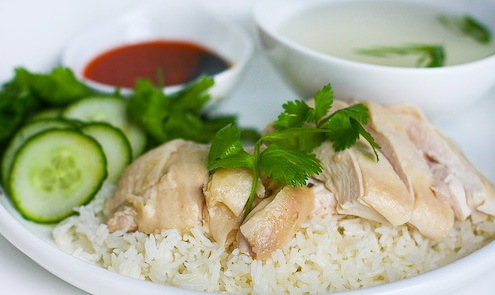 There are two claims to fame with regards the origin of HAINANESE CHICKEN RICE. Personally, I don't really care whether that credit goes to the Chinese island of Hainan or to Singapore; all I know is that it's hugely popular here in Malaysia. Essentially, this is a dish of delicately poached chicken infused with ginger and a wee bit of soy sauce, whilst the accompanying rice is cooked in chicken stock. Soft and tender, the chicken is most satisfyingly-consumed in mouthfuls (no need to be shy) together with the fragrant rice and a tad of ginger-based chilli. Thick oyster sauce may also be used as a dip for the chicken. Particularly popular among the Chinese here, Hainanese chicken rice can be easily found at street hawker stalls or in traditional Chinese coffee shops/restaurants. CHAR KOAY TEOW (pronounced "char kw-ay tee-ow") is basically flat rice noodles fried with prawns, chives, bean sprouts, cockles and Chinese sausages. Pork lard is sometimes added to give this dish a more full-bodied flavour. A well-prepared plate of char koay teow should carry a "smoky" fragrance and taste - the result of frying the ingredients over a strong charcoal fire (it is this very taste that makes this unique Malaysian dish so divine). 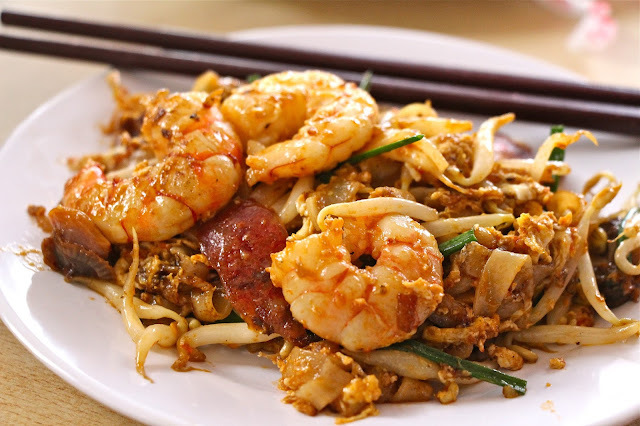 Although char koay teow can easily be found anywhere on the west coast of Peninsular Malaysia, visitors really needn't look further than the island city of Penang for the best (and cheapest) ones. Greasy stuff I admit but its wholesome flavour certainly packs a punch which leaves you wanting for more. And more. Finally, allow me to introduce to you the mother of all Malaysian foods - our very own NASI LEMAK. 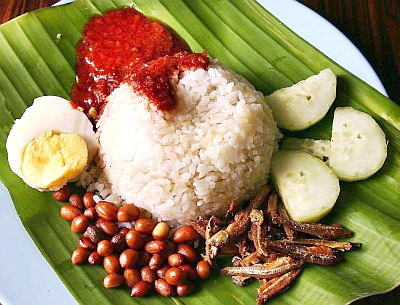 With roots set in both Malay culture and cuisine, the term nasi lemak (pronounced "nah-see luh-mahk") literally means "fatty rice" - or, in this context, "rich" or "creamy" rice. Frequently taking centre stage at Malaysian food fairs abroad, few will argue nasi lemak is the undisputed national dish of Malaysia. This a fragrant rice dish cooked in coconut milk with knotted "pandan" (screwpine) leaves and a stalk of lemon grass thrown into the rice while steaming to lend it more aroma. Traditionally and in its most basic form, nasi lemak is served wrapped in banana leaves, with fresh cucumber slices, fried anchovies, roasted groundnuts, poached eggs and a generous portion of spicy, chilli-based gravy (or "sambal"). However, as a more substantial meal, nasi lemak can also come with a variety of accompaniments such as fried chicken, cuttlefish, pickled vegetables, shrimp or beef. Easily found in every major Malaysian city or town, nasi lemak is consumed throughout the day by Malaysians, be it for breakfast, lunch, dinner or even supper. Such is the popularity of this truly wonderful dish. As a side note, wanna know our beverage of choice for washing down all those wonderful food? 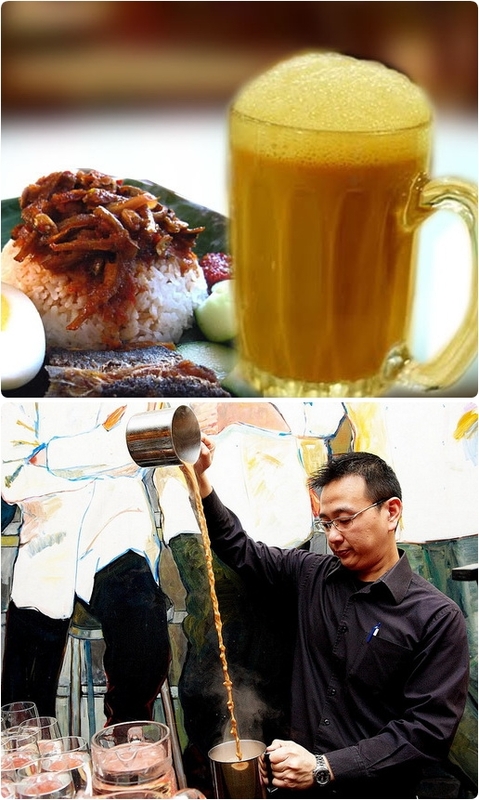 The answer is TEH TARIK (pronounced "tay tar-rek") or "stretched tea", an Indian tea beverage made from black tea, condensed milk and evaporated milk. Its name is derived from the pouring process which involves "stretching" or "pulling" the concoction before the tea is finally served. This entails repeatedly pouring the mixture back and forth from a height between two pitchers to give the beverage a frothy top. This also cools the tea to optimal drinking temperatures and is believed to give the beverage an enhanced flavour and a lasting after-taste. There's an inevitable element of showmanship involved in preparing teh tarik which both locals as well as visitors alike find to be quite a novelty. A glass of this heavenly tea typically costs about US$0.40 on the streets. There are of course numerous other types of genuinely lovely food for visitors to savour here in Malaysia, and I've really only skimmed the surface by highlighting those that are considered the most popular amongst us locals. But don't take my word for it; do come to my beautiful homeland and try them for yourself. Have you visited Malaysia before? If so, how did you find our food and cuisines generally? Great collection of dishes, reading this is making me hungry, thanks! Thank you, Alice. Oh, what I'd give for a large plate of char koay teow now! Nice collection of food.I like your blog. Thanks for sharing. Frozen foods are technically considered raw foods although some of the vegetables may have been lightly blanched.